Simon & Schuster, 9781501134258, 240pp. Alain de Botton is the author of numerous works of fiction and nonfiction, including On Love, How Proust Can Change Your Life, The Consolations of Philosophy, The Art of Travel, and The Course of Love. He lives in London where he founded The School of Life, an organization devoted to fostering emotional health and intelligence. More can be found at AlainDeBotton.com. "For me, the publication of any book by Alain de Botton is as much a reason for celebration as it is for cerebration, and his novel The Course of Love is a satisfying look at relationships and the perils of romantic love. This public philosopher writes with verve." "This book is like a self-help book for dating and relationships, disguised as a novel...We understand what each person is thinking and why, with de Botton’s insights sprinkled in. It made me rethink what it means to be happy in a relationship." "Assured...The author deftly delivers both sides of the marriage, exploring the incompatible interplay of romantic love and practical love...Part literary novel, part self-help handbook, “The Course of Love” certainly illuminates the subtle and not-so-subtle fissures of one modern marriage and what it takes for two people to stay together through the years...this nontraditional novel is generous in its spirit and message." "A cunning novel that tells of a couple from the spark of first love, maintenance through the demands of children and career, the challenges of boredom, and aging. What happens to our original ideals under the pressures of an average existence?" "A living, volatile portrait of how two very different souls love, complement and aggravate each other. 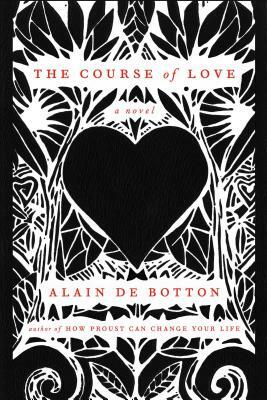 You may not agree with all of de Botton’s thoughts on marriage, but it’s wonderful how he makes such a big, sweeping subject out of routine existence...[De Botton's] uncanny access to Rabih’s and Kirsten’s contrasting feelings, aspirations, insecurities and resentments at every changing stage of their love lives makes the novel a marvel." "An ambitious book; one that resolves, if it cannot change art, to widen our expectations of what we might go to a novel for. The lives of Kirsten and Rabih...help us in a solemn way to examine the illusions and pains that loving relationships are heir to. The Course of Love testifies that discontented families, if we cannot call them unhappy ones, are much alike after all." "The Romantic Movement sheds light on the nature of relationships...The method of telling much and showing little produces a good deal of wit, cogency, and humor." "A reader gets whiffs of Donald Barthelme, Julian Barnes, Woody Allen...De Botton borrows exuberantly, and well, from forebears [and] therein lies the buoyant charm of this approach." "Smart and ironic...The success of On Love has much to do with its beautifully modeled sentences, its wry humor, and its unwavering deadpan respect for the reader's intelligence." "Delightfully original.... As well as being criticism, biography, literary history, and a reader's guide to Proust's masterpiece, this is a self-help book in the deepest sense of the term." "One of my favorite books of the year.... Seriously cheeky, cheekily serious." "Curious, humorous, didactic, and dazzling.... It contains more human interest and play of fancy than most fiction." "A witty, elegant book that helps us learn what reading is for." "A wonderful meditation on aspects of Proust in the form of a self-help book. Very enjoyable." "An enjoyable read... In clear, witty prose, de Botton...sets some of [the philosophers'] ideas to the mundane task of helping readers with their personal problems.... The quietly ironic style and eclectic approach will gratify many postmodern readers."